Are you looking for a fun, but educational way to spend time in the swimming pool with your kids? Try tweaking a classic board game and turning it into a great swimming pool game! With a few everyday household supplies, you can create a fun pool activity for children of any age. 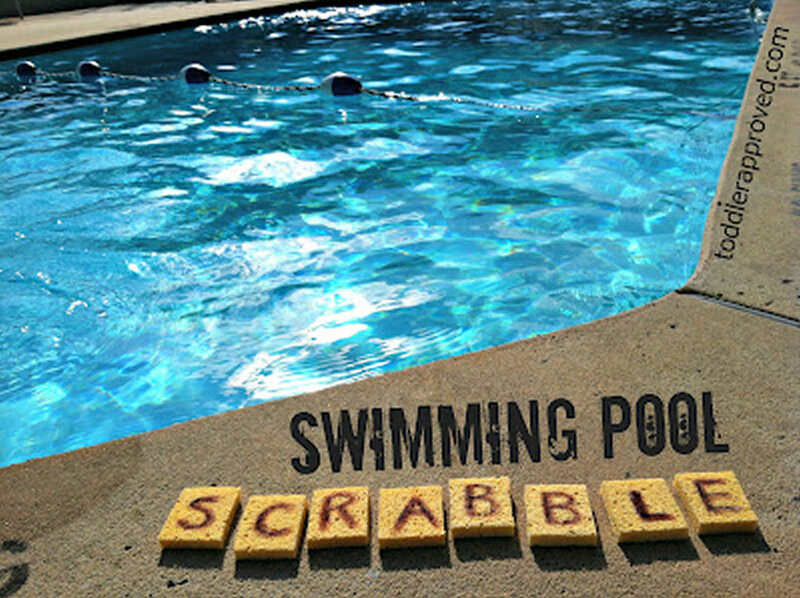 Here is an idea for swimming pool scrabble from Toddler Approved! Cut sponges in half. Write letters on each sponge. We only put letters on one side, but you can easily make these “tiles” double sided to give you more spelling options. Throw the “scrabble sponges” in the pool, then swim to collect all of the pieces. If your children are young and still learning to swim, try having them work together to collect all of the pieces and take turns swimming out to grab a letter, instead of making it a competition. If your kids have more developed swimming skills, you can maybe turn it into a race to spell the longest word, or a relay race between teams of swimmers. There are also fun ways to adapt this pool activity for extremely young swimmers. For three year olds, you can have them practice putting the letters in alphabetical order, or finding the letters that make up their own name. With older children, you can see how many words they can spell from a small collection of letters. However you decide to adapt swimming pool scrabble for your young swimmers, it is sure to be a great way to learn about language and vocabulary while practicing some of swimming skills.